In 1958 the Prime Minister, Sir Robert Menzies, made an election promise to convert Australia's currency to the decimal system. In February 1959 the Treasurer Harold Holt established the Decimal Currency Committee. They investigated the advantages and disadvantages of a decimal currency and made recommendations about the unit of account and denominations of subsidiary currency most appropriate for Australia. The Committee presented its report in August, 1960. 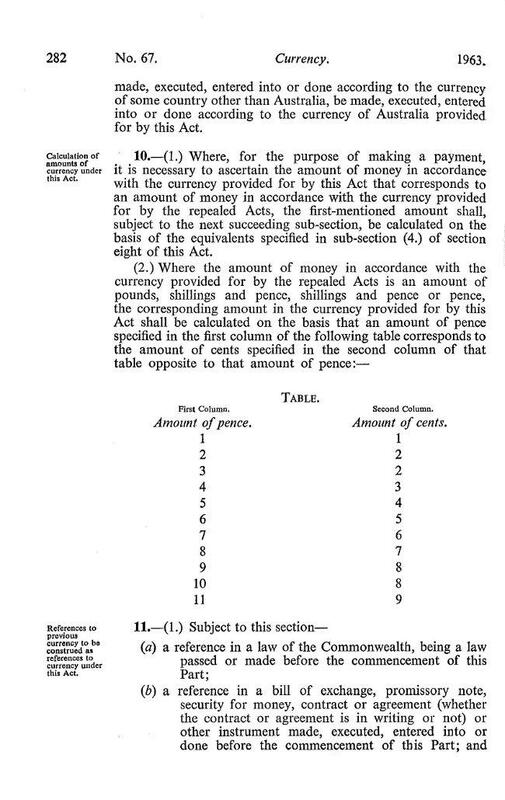 This resulted in the Currency Act 1963 ( PDF 425Kb) that set out the conversion to decimal currency. At that time, Prime Minister Menzies preferred name for the currency was the 'Royal' for what is now known as the Australian Dollar. On 14th February 1966 decimal currency was introduced into Australia. Several folios in the file ‘A66/3768 M - Department of the Interior - Land Rent Procedures and Instructions - Revenue Section’ were generated in regards to the methods used in the conversion to decimal currency. The first extract from this file (folio 48) is an example of a Departmental paper trail generated by the application of the currency conversion tables. The folio for the 18th October 1966 describes how a transcription error led to the incorrect conversion of pence to cents in the land rents being charged. The Commonwealth Treasury memorandum dated 26th October 1966 discusses the application of a conversion table to Land Rents.